In a medium bowl, mix graham cracker crumbs, sugar,and melted butter until combined. Press into the bottom and up the sides of a 9-inch springform pan. Place in the refrigerator to chill for at least one hour. Preheat oven to 350. In a large bowl, combine brownie mix, pudding mix, water, oil, and eggs. Stir with a wooden spoon until combined. Pour into prepared crust. Spoon peanut butter into a bowl and heat in the microwave for approximately 20-30 seconds, until softened considerably but not liquid. Spoon into brownie mix and swirl with a knife. 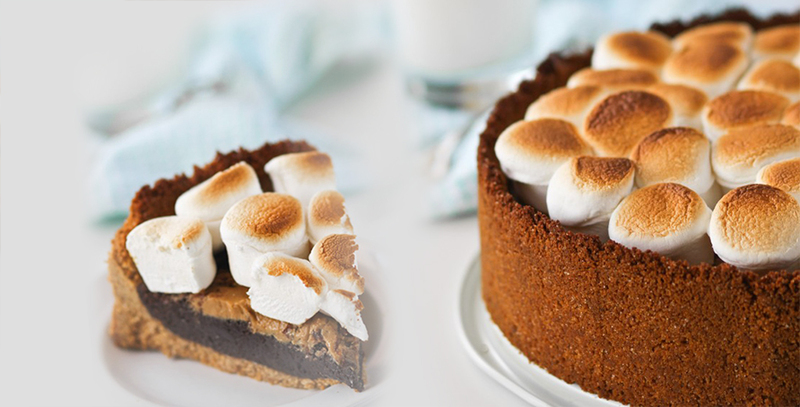 Bake pie for 30 -40 minutes until just barely underdone — a bit of fudgy, gooey batter is okay, but you don’t want the middle of the pie to be raw. Remove from oven and let cool on cooling rack to room temperature, then chill several hours for easier cutting and serving. 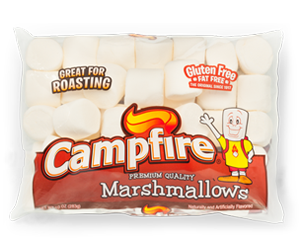 Top with whole Campfire® marshmallows, then place in your oven set to broil for several minutes, until the top is golden. Slice and serve. Spray a sharp knife with nonstick cooking spray before slicing to prevent the toasted marshmallow from sticking to the knife.